In 2011, Lester Avan Andrada, a Communication Arts majoring in Theater student at the University of the Philippines in Los Banos (UPLB), became an exchange student at the Far East University (FEU) in Korea. As he was training at FEU-Korea's Theater and Acting Department, he saw an ad for a role in a Korean film posted by a talent agent in March last year. He tried his luck and auditioned the following month. "During the audition, I acted out a scene taken from the script which I got five days prior to the audition day. In the scene, I tried asking some Koreans to help me find a particular address. My speaking lines were all in Filipino. I sometimes spoke English but in a fragmented way," Andrada told Bulletin Entertainment in his first media interview. He passed the audition and started filming in May 2012 which ended in October under a contract with entertainment agency Sidus HQ. On Aug. 15, Andrada's dream will be fulfilled with the release of the Korean movie "The Flu" in Korea. "The Flu," starring popular celebrities Jang Hyuk and Soo Ae, is about a deadly respiratory disease that infects people in Bundang in Seoul. The epidemic infects about 2,000 per hour and death is expected within 36 hours. In the film, Andrada said he played the role of Mongssai, an illegal overseas Filipino worker (OFW) who was smuggled into Korea along with other illegal workers from other countries. He said he will attend the premiere of the movie in Korea scheduled on Aug. 5 and 6. Before the film's release, "The Flu" has already gained interest from buyers from 38 countries after the trailer was shown at the 66th Cannes Film Festival last May. Andrada is graduating this semester from UPLB. He's the only child of Gina and Cesar Andrada from Calamba, Laguna. He said that after his father died when he was only 13, he started helping his mom with the family expenses. 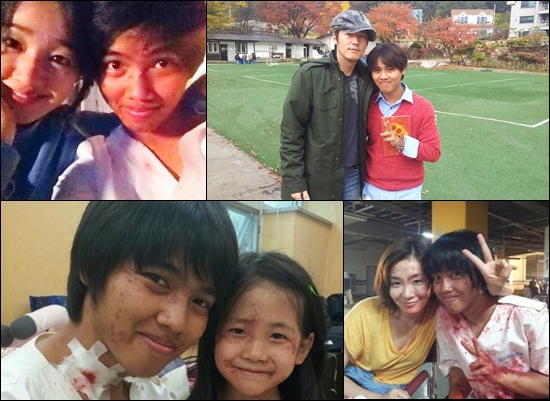 "The Flu" is his first acting job although he participated in different theater productions at UPLB and FEU-Korea. Andrada, 21, talked about his experience working in the film and with Korean stars, and his future. Bulletin Entertainment: How many people auditioned for role? Andrada: "I'm not sure of the exact number but the assistant director told me that about 20 people submitted resumes applying for the same role." How did it feel to work with Korean stars like Jang Hyuk and Soo Ae? "It was an incredible experience to have worked with famous actors like Jang Hyuk and Soo Ae. They are awesome people. Everytime I hear from my Korean and Filipino friends how famous they are in the industry, I just can't help but be amazed and dumbfounded. I didn't realize that I have worked with such big stars until I saw the promotional materials. Although they are famous actors, I didn't feel awkward during our shootings. They were all very approachable and like any other normal friend, they'd love to mingle with us especially during the breaks and when there are production dinners or parties. We always talked during breaks and I actually had the chance to tell them about the Philippines. I even invited them to pay a visit to our country and have tropical summer experiences in our white beaches and other tourist spots. They said they'd love to." Did they require you to learn the Korean language? "Actually, the moment I auditioned, I can already speak Korean. I learned Korean when I went there for the student exchange program. I always read Korean scripts and texts and tried to translate and analyze them. I also love to watch Korean film which might be the reason why I learned the language very quickly. The director said that it's an advantage for me that I can speak their language because it can help me to have a better understanding of the industry. Although the director can fluently speak English, he said that it's better that I can understand their language because he thinks that he can express or convey himself better through Korean. The director often gave his directives in Korean. If I didn't understand something, I would tell the assistant directors and that's the moment an interpreter would do his job. The movie script and even my lines were also written in Korean. I translated it word per word and tried to have a good grasp on it by reading it often." Are you going to pursue your acting career in Korea, or here in the Philippines? "As of now, I have future plans of pursuing my acting career in Korea since I started it there. I have been well exposed to their film and performing arts industry and I see a lot of reasons to pursue my dreams of being a professional actor in a country with thousands of accomplished actors and artists." What are your talents and hobbies? "Acting is my first love and singing is my second. I've been dreaming of becoming a famous actor since I was a kid. I play the piano and organ. I am an organist in our Church. I love to watch movies, specifically Korean movies. I also love to read novels and other literary pieces. Since I am a student of Theater, I always expose myself to different theatrical forms. Korean theater is one form which I find interesting and fascinating." Who are your favorite Korean and Filipino stars? "My favorite Korean actors are Jang Dong Geon, Won Bin and Ha Jeong Woo. They are really great actors of Korea. In Filipino films, my favorites are Dingdong Dantes and Maricel Soriano." "I want to pursue my acting career and be successful in this industry. When I earn enough, I plan to build an Art Academy here in the Philippines which will help young and talented Filipinos hone their crafts and talents. I want to help them achieve their dreams and prove the world that we, Filipinos, can."